The notorious Islamic State executioner Mohammed Emwazi, better known by the nickname Jihadi John, has reportedly been targeted by a US airstrike in Syria, US officials said. The Pentagon is still accessing the results of the assault. The airstrike allegedly targeted Emwazi’s vehicle near the Syrian city of Raqqa – the self-proclaimed capital of Islamic State (IS, formerly ISIS/ISIL). “We are assessing the results of tonight’s operation and will provide additional information as and where appropriate,” Pentagon press secretary Peter Cook told the media. The Pentagon is still trying to determine whether Jihadi John was killed in the airstrike. “It’s still a little early but we are reasonably certain we killed the target that we intended to kill, which is Jihadi John,” Steve Warren, Pentagon spokesman said later on Friday. “It’ll take some time of course to formally declare that we have success,” he added. Emwazi, dubbed Jihadi John, first appeared in an online video showing the murder of US journalist James Foley in August 2014. He was subsequently shown in other videos of further IS beheadings of US journalist Steven Sotloff, British aid worker David Haines, UK taxi driver Alan Henning, and American aid worker Abdul-Rahman Kassig, also known as Peter Kassig. 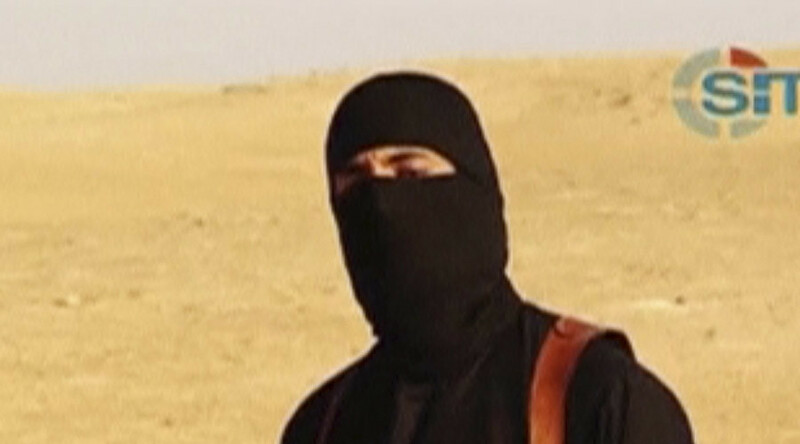 In each of the clips, Jihadi John appeared wearing his signature black robe, with a black balaclava covering his face. In August, Emwazi threatened to return to the UK with the Khalifa (the leader of the caliphate) to ‘cut heads off.’ The footage was said to be the first glimpse of the IS militant since he appeared unmasked in February. UK Prime Minister David Cameron said in a press conference on Friday the US drone strike on Emwazi was “the right thing to do,” but stressed it was not yet certain whether the IS militant was killed in the attack. David cameron does enjoy a good drone strike in self defence doesn't he? I'd prefer Jihadi John have faced justice but am glad he's dead. “We cannot yet be certain if the strike was successful, but let me be clear. I have always said that we would do whatever is necessary, whatever it took, to track down Emwazi and to stop him taking the lives of others. We have been working with the United States, literally around the clock, to track him down. This was a combined effort, and the contribution of both our countries was essential. Killing Emwazi was not 'self defence' it was the targeting of an enemy combatant. Cameron using same terms as Blair justifying Iraq war. Cameron said he wished to thank the United States for its role in killing Emwazi. “The United Kingdom has no better friend or ally,” he said. “I can’t tell you for sure that the strike was successful, because we don’t have that information yet,” UK Foreign Secretary Philipp Hammond said. “We are obviously pursuing all possible avenues to confirm that he is dead although we believe the strike was successful,” he added. Labour Party leader Jeremy Corbyn said Emwazi should have been tried for his crimes. “It appears Mohammed Emwazi has been held to account for his callous and brutal crimes,” Corbyn said. “However, it would have been far better for us all if he had been held to account in a court of law. The Turkish authorities have reported the arrest of a suspected associate of Jihadi John in Istanbul, according to Reuters. The detained is thought to be Aine Lesley Davis, one of the British jihadists, who was guarding foreign prisoners in Syria. Born in Kuwait, childhood friends of the 27-year-old said he spoke little English when he arrived in the UK in 1993. He was the only Muslim pupil in his class at St. Mary Magdalene Church of England primary school in Maida Vale, West London. He regularly attended a mosque with his parents and five siblings, as well as embracing the British culture of his classmates, one source said. The British authorities first came into contact with Emwazi in 2009 after he was stopped during a post-graduation safari trip to Tanzania. They claimed he had links to the Somali Islamist militant group Al-Shabab. According to advocacy group CAGE, which was in contact with Emwazi for two years before he disappeared, he was subsequently denied passage to Kuwait several times. They also claim MI5 tried to turn him into an informant. The daughter of Alan Henning, a British aid worker who was murdered by IS in 2014, appeared on UK television chat show The Jeremy Kyle Show on Friday to discuss her father’s execution. Eighteen year old Lucy Henning, who appeared alongside her cousin Charlotte, confirmed her father’s body has not been returned home. She criticized the UK media’s “negative press” on Syria and called for donations of clothes, money and time to help Syrians. “Just try and make a different, instead of holding negativity,” she said. Alan Henning’s brother told ITV News he would have preferred for Emwazi to go on trial. “Hopefully this is the end of it. I am glad he is dead,” Reg Henning said. Henning’s nephew tweeted he had “mixed feelings” about the news. “State sponsored targeted assassinations undercut the judicial process … by which violence can be stopped,” the organization’s director Dr Adnan Siddiqui said. This is backed up by reports that US authorities threatened families if they negotiated payment of ransom money. “Emwazi’s execution of defenseless hostages was inexcusable. But all avenues that led him to that point need to be investigated. CAGE’s repeated efforts and offers to negotiate for the release of Alan Henning were obstructed and squandered by the UK government and serious questions remain regarding these failures. “CAGE has acknowledged mistakes were made in our handling of the Emwazi affair, but we reiterate our call for a full inquiry into what caused Emwazi to feel so alienated in the UK that he felt his only option was to leave. “Such an enquiry is essential if we are to understand and put an end to individuals being drawn into political violence,” the group added.